An engineer who ruined his reputation with the massive Coiypax Corporation, Derric is desperate to start a new life. He’s about to catch a shuttle off-world when a beautiful pilot, Ellie, tries to recruit him for a salvaging operation in the Outer Territories. Derric is not thrilled at the mention of this lawless region of space, or the unusual goal of retrieving Reptilia Droc technology. After all, what could be gained from a species of reclusive savages? 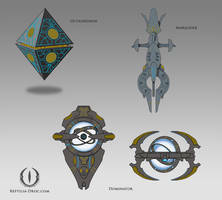 However, when Ellie tempts him with scans of an advanced, alien warship, Derric surrenders to curiosity and ambition. Adventure soon gives way to fear, as the crew is relentlessly threatened by the hostile factions stalking the void. Meanwhile, the growing path of destruction left by the Reptilia Droc will call into question everything Derric previously believed about the Galactic Corporations. As Derric draws closer to the truth, he will find his courage, and ingenuity, put to the ultimate test. 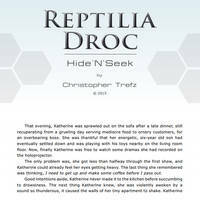 Stop by my web site www.reptilia-droc.com/ to learn more about the basic story-line and read the first chapter. Thanks. I'm hoping the illustrations will help catch people's attention and add to the experience. I've been thinking of maybe adding some of my illustrations in the book, well not a lot as it needs a balance but like the idea. *Note - This is an early draft of a novel I had planned, but is currently on hold. 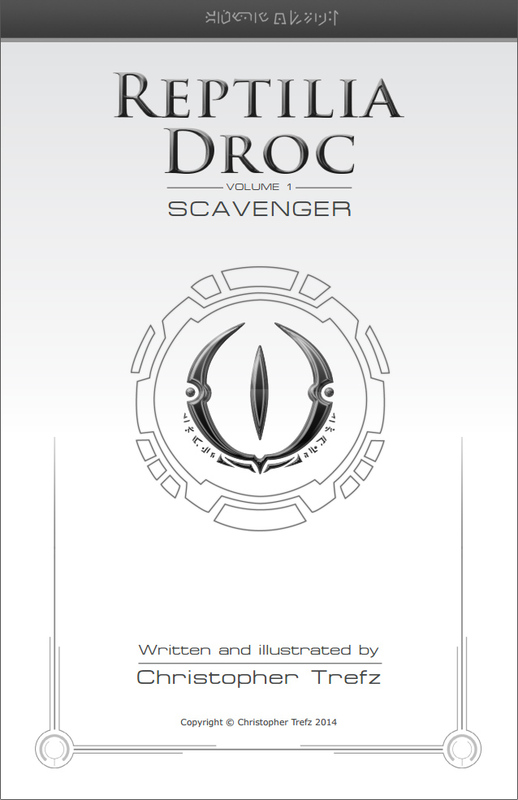 It is no longer canon with the Droc series, just posted for fun. Looking up into the night sky, it's easy to feel that we are alone in the universe. Space is so vast, and at first glance so empty. But deep in the void, past any recognizable constellations, the life among those distant stars is beyond imagination. Unfortunately, where there is life there is also inevitable conflict. This story begins on the fifth planet of the Goahara system. On this world, the atmosphere, temperature, and most importantly water were in that perfect combination to have given rise to expansive lush, green forests which sprawled across its surface. Among the landscape of rolling hills and dense foliage, a variety of creatures went about their lives. "Twilight? What are you doing?" Her mother asked looking down at the little filly who seemed to be nestled on a pillow surrounded by a fort made out of books. "The munsters can't get me while I read now!" Filly Twilight spoke up in her young cheerful voice before sticking her nose back into the book and happily read away at her latest adventure. Celestia stifled a giggle as the more adult Twilight who stood next to her blushed. "I forgot how adorable you had been." Celestia commented.
" Twilight said trying to laugh her blush away. The ghostly image of that memory seemed to fade away and was replaced with another, this one a scene of Twilight's mother reading a book to filly Twilight. Pinkie took a gulp as she stared at the door that led to a separate chamber from the rest of the prison. The cells were officially classified as 'Solitary Confinement', however the only thing that made them 'solitary' was that they were separated from the other cells and most criminals only stayed in them for a few days for misbehaving. But from what she'd been told the criminals kept themselves in good terms to avoid coming here because of the one prisoner that was kept inside at all times. None of them wanted to be in the same area as him. and I can understand why. There's still time to back out, if you don't want to do this." Came the reassuring yet regal voice of Princess Celestia, who turned to look at the smaller pink mare standing next to her before the door. at the time, I felt like nothing bad could go wrong. “Mommy, mommy, mommy (100x)!” the two little female Oriharas shouted as they entered the house after their father picked them up from school. “It’s getting bigger with the passing of time.” Chrome added, the way she spoke this sentence reminded a lot of her father’s sing-song voice. [Name] got more confused at what her daughters wanted to ask her and doubted that she’ll be able to do fulfill it easily. “What do you want?” she finally asked. OdysseyThis ends tonight. He promised her he would make things right and he was a man of his word. Now if he could only figure out how. He kept hidden in the dark passages behind the walls, waiting for the right moment to move. Keeping track of the glowing light beyond the door, in this world the sun never rose and the only light came from the over sized moon that hung in the sky. Bright and unmoving. It shined on a massive complex of white pearlescent buildings reminiscent of ancient Greece that had been carved into the side of a mountain. Aside from the moons light, numerous pillars that contained a softly glowing light illuminated the many outside walkways. Lights that he was waiting for to dim, singling the arrival of sleeping hours. “Why’d you laugh at it, then?” I could hear him grinning through the curtain. His feet were thumping on the hardwood floor, and I could imagine him almost falling over as he slipped in his socks. I giggled into my hand. EvieIt started with the falling flowers. Evie sat on the small balcony's balustrade and watched the red petals drift down to the street. They were the only color on the gray asphalt, surrounded by lighter gray walls under a cloudy sky. Like diamonds, Evie thought, or drops of blood. Her feet dangled in the air, five stories above the ground. Her parents always told her not to sit on the balustrade like that – you'll break your neck one of these days – but when she was alone, Evie did it nonetheless. Hour after hour, day after day. Only the old man living in the flat above would accompany her, though he probably didn't even know that she was there. Humming, he would water his flowers, pluck off dead leaves, put them from the shade into the sun and back again. Every day, until now. Now, the red petals were falling, and Evie knew that he was gone. The MiracleHe was on the corner of the street where she always walked to do her parents's chores. He just sat there, waiting, hoping without hope that someone would give him enough money. She looked at him daily, crying silently, her heart breaking as she imagined him there, during the cold nights, shivering, with no pillow, no blankets, no mattress, only the bare cold cement of the side-walk and his ripped coat. She would look down at her bags of grocery, guilt invading her, gnawing at her. She only wanted to give him everything she brought. She only wanted to give him even just one item. But she couldn't. Her father gave her only a small amount of money, and a specific list of groceries. Everything she bought, had to be there when she came back home, and the money was always used completely. And every week, she had to walk past him, and never be able to give him food; and invariably, she would be tortured during the night how hungry he must be, how thirsty, never being able to taste good food. Taste For AdventureGraham woke up the same time every morning. 8:37 A.M. It was something that she had done over and over and over again since she was taken in by the priests. As she opened her eyes and took in the sight of the bright light pouring in from the window, highlighting her blue and white quilt and the wooden floor of her quarters, she had a strong urge to just keep right on sleeping. But she couldn’t just sleep the day away; for the same reason why she didn’t anyday. she had duties to attend to in the monastery. Sluggishly, she sat up and wiped the clumped up hair out of her eyes. She pushed away the thick quilt and pulled her feet out from underneath, allowing her to swing around and place them by her bedside. she stood up and stretched a little, attempting to purge the last bit of sleepiness from her body. She stared out the somewhat dirty glass of the large window just by her bed. Outside was Asphodel, arguably one of the prettiest regions in the land. You say the words so casually. Completely devoid of any emotion. You stare me dead in the eyes. My mouth opens in shock. My eyes search your face desperately for any indication that you’re joking. You’re not. Your expression remains the same. Impassive. Serious. Resolute. You watch me as I fall apart before you. I drop to my knees. Broken. Without another word you turn around and walk away from me. I reach my arm out and desperately try to think of something to say. Anything to make you change your mind. Anything to make you stay. But no words reach my mouth. You are gone forever. In the tailor the men attended you very kindly and quickly, it took only a few seconds to be fully dressed with some very simple White robes, actually they kind of materialized on you and after having paid the service you ran back to Isola Tiberina in which Maquiavelli was already waiting for you in the front door. Ruckus 1In this jungle of concrete and metal worlds collide in an explosion of culture and contradictions. Here the lines of what's real and unreal seem to just disappear and the rules of logic and rationality seem to blur into nonexistence. For Tai this city was more than a foreign country, it was like a whole different world yet he managed to fit in somehow. The sun was oppressive today but for the large man it was nothing compared to his island home across the ocean. Tai became a common sight in this suburban area of the city, his large stature accompanied by dark skin and hair made him stand out just as much as his decision to wear shorts and sandals with a white lab coat which became his most common attire. He had happened upon the room by pure chance. The Captain's disappearance had put the Engineer on edge. That man was the key to his survival and it was only a matter of time before some hazard of the wasteland would claim his life. Surprisingly it just took a few hours to locate him and Gromov was sure it was only because of the luck that Captain seemed to rub off onto others. He found Captain holed up in a mostly collapsed building, the only part that remained intact was a small dark room. Breathing a sigh of relief he was about to enter the room to reprimand the man for disappearing without a trace for days but stopped, his boot hovering just over the threshold. Captain's purple lenses glinted from the darkness. Gromov backed away. He never entered the room.